Continuing with ESR Around the World from New York City, let’s talk about Beard Papa. Don’t worry Vancouverites – you can try Beard Papa without going to NYC; their one and only Canadian location is in Richmond‘s Aberdeen Center! Lunch at Numero 28 was filling, but I still wanted dessert. Across the street from Numero 28, on 5 Carmine Street (Google Maps Street View is amazing btw), I saw something I wasn’t expecting to find in New York City. 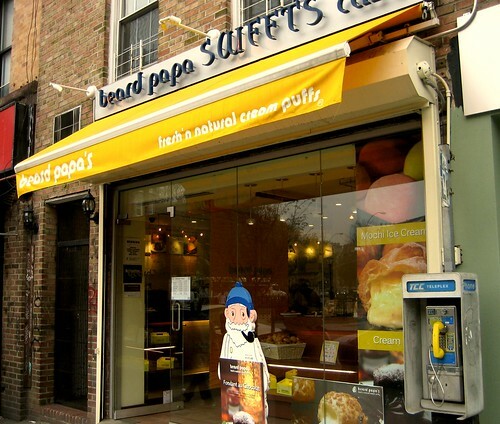 Beard Papa, a Japanese company founded in 1999, has over 250 locations in Japan and another 50ish scattered around the world in China, Korea, Taiwan, Australia, the USA, and others. As I mentioned above, their first (and still only) Canadian location opened up last year in Richmond’s Aberdeen Center; you can find it in the 3rd floor food court. So what is Beard Papa? Their motto is “fresh’n natural cream puffs“. 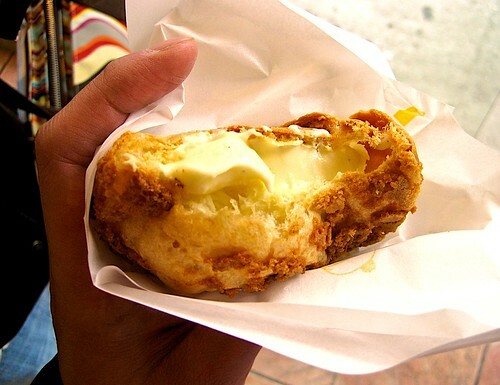 Although they also have cakes and mochi ice cream, they are most famous for their cream puffs. These fluffy Choux pastries are baked every morning and cream-filled throughout the day to maximize freshness. There are different flavors of cream filling (coffee, chocolate, green tea, strawberry, etc.) that rotate on a daily schedule. However, every time I’ve been to the Richmond location, they are always out of the “special flavors” and only have the classic vanilla-filled ones. They taste awesome. When you take a bite, the flaky pastry crushes under your teeth until you reach the cool, cream filling. Even though there’s a lot of cream, it’s fairly light and not too decadent. Even after a big meal, there always room for 1 or 2 Beard Papa cream puffs. They’re ideal for takeout too. Share a dozen of these and I guarantee that you’ll be the most popular kid on the block. The negatives are that they are priced fairly high (~$1.50 per cream puff if you buy less than 6), they need to be eaten as soon as possible to ensure freshness, and there are often long lines during peak hours. My 1st NYC breakfast may have been cheap, but it didn’t exactly fill me up. After walking down Broadway and exploring Greenwich Village (extremely cool and pronounced “greh-nich” btw), I was beginning to get hungry again. Hmm, what to eat? 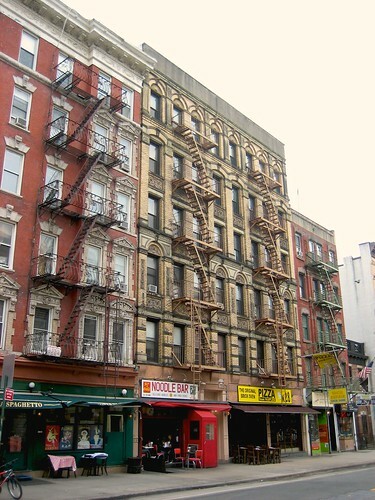 What do we have on this Greenwich Village street? A spaghetti restaurant, a noodle bar, and a pizzeria: melting pot indeed. 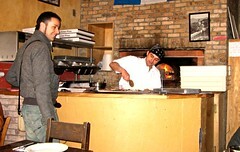 I chose the Numero 28 pizzeria (the one with the yellow sign) as it seemed the most New York-y to me at the time. Stepping inside, the first thing I saw was a real wood-burning pizza oven. Good start. The waiter seated us at a table and I took a look at the menu. I wanted a simple and authentic thin-crust pizza with some veggies and a little meat. The prosciutto caught my eye. I wasn’t sure what the Piadina was so I asked what the “Stuffed” referred to. The waiter told me, in a rude tone as if I should’ve been born with this knowledge, that it was a stuffed pizza similar to a gyro. I wanted a real pizza so I went with the S. Daniele ($15 for the 14″). Before the waiter was able to escape, I asked him what “rucola” was. He gave me a disgusted look, told me that it referred to arugula, and walked away. Ouch! And here I thought I was ahead of the curve for already knowing what prosciutto and parmigiano were. I was a bit annoyed at the waiter’s incredible rudeness, but then I remembered that I was in New York City. When he brought out the delicious pizza, all was forgiven. I haven’t had such a tasty thin-crust since visiting Europe a few years back. 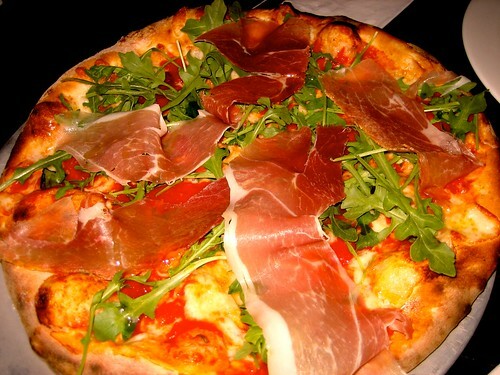 The crust was crispy, the “rucola” was so fresh it was as if it grew out of the crust, the cheese was nice and light, and the cured prosciutto was salty as hell. Sure beats the Panago we always order at the office. Fantastic lunch, despite the NYC attitude.